After going to K of P to return a bunch of random crap that none of us needs, we decided to eat at Legal Sea Foods, because R had never been there and she loves her some damn seafood. It was pretty late, and the place is big, so there weren’t too many people in there. 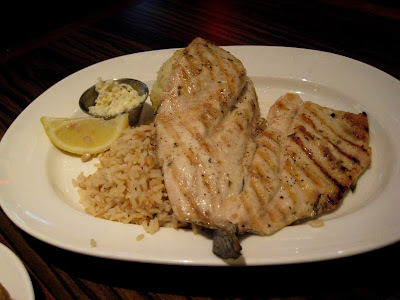 R got the rainbow trout with horseradish butter, rice pilaf, and mashed potatoes. Their choice of sides is uber heavy on the carbs. There should really be more veggie choices, pretty please. The trout was fine, but she really dug the horseradish butter. The thought of this revolts me, as I can’t stand horseradish. But she loved it! She got the clam chowder too. At first, she ordered the lite clam chowder. We thought this would be a lighter version of the new england clam chowder. Wrong! It is a lite clam chowder, and definitely nothing like new england. One look at its weird watery broth and seeing nothing but chopped carrots and celery, she sent it back. Then she got the proper new england chowder. So be warned, they are completely different soups! She felt the same way about the new england clam chowder as I did. That’s it’s nothing special. I got the scallops again, because I got them the last time and loved it, and I’m someone that likes to stick with what she know sometimes. Not all the time, but sometimes. I got pilaf and asparagus. I had wanted sugar snap peas but they were out, but luckily, they had asparagus instead. 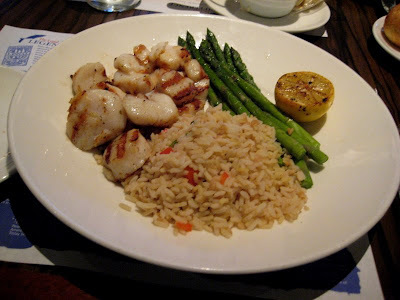 I really love these scallops. They’re just grilled but that’s all they need. They’re awesome. And it’s a nice portion too. I had enough to take home and eat the next day with some noodles I cooked up. 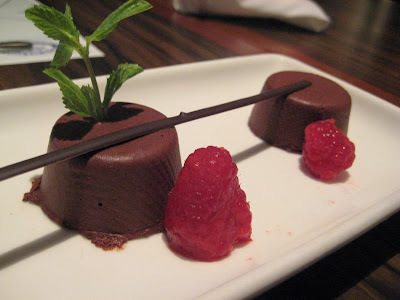 R felt like dessert, so she got this gluten-free chocolate mousse. Ok, first off, this is not mousse. It’s not light and airy and moussey. It’s a thick and rich tort. You get three little hunks of these “mousse” and not only is it gluten-free, but it was also nonfat. All those things scream tasteless in my book (haha), but this was actually pretty good. A little too chocolatey for my taste! But I was still impressed by the flavor, considering how “healthy” it was. Overall, another solid meal, but nothing super fantastic. I think this is what Legal is. Good food, not crazy prices, but not cheap either, with nice atmosphere. I think they want to be fancier than they think they are. And for whatever reason, our server really annoyed me. She was beyond fake and artificial and I think it oozed out her bitter food service worker pores.